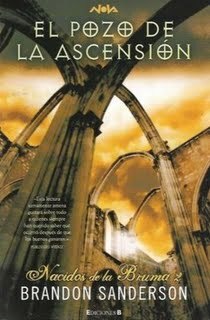 He "Well of Ascension"It is the second installment of the saga"Mistborn"Brandon Sanderson and is as addictive as the first ... even though not science fiction but fantasy. As in the first part, the story takes place in a world in which the last thousand years has been falling ash as a rain (for reasons still unknown but are linked in some way to the rise to power of the Lord Ruler) and every night impenetrable mist covers your world. The society describes Sanderson is divided between skaa (Slaves) and nobles who often have powers Allomancers allowing their bodies to burn certain metals for special skills. The Allomancy It is an inherited trait but not dominant. By extravagances of genetics, some characters in our history have the concentration of all these powers and become "Mistborn"Beings capable of burning any kind of metal Allomancer and get skills that becomes almost invincible against conventional armies. In the book first we saw the fall of the Lord Ruler after a thousand years of absolute rule through terror and control Allomancy. The Lord is defeated by a whole group of characters formed by a band of "thieves" and their allies, both of noble birth and origin skaa, Led by Kelsier, who dies at the last moment to liberate the people skaa. En esta segunda entrega, el libro trata sobre cómo los protagonistas de la historia (ya sin Kelsier) sobreviven a las consecuencias de la caída del Lord Legislador y a todo el caos económico y social en el que queda sumido el mundo tras mil años de estabilidad. Some characters that do not have these powers, they can also use skills storing bracelets and rings (the author calls ferruquímia). These characters can build physical strength, speed, heat, mental speed, etc. depending on the metal of the ring or cuff is composed.